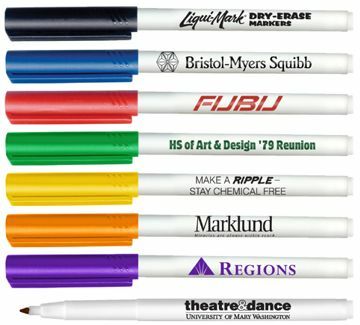 Wholesale Custom Dry Erase Markers, Personalized or Blank. Promotional, Inexpensive. Fine Tip, Made in USA, Low Odor, Non Toxic, Large Imprint Area. Bulk personalized dry erase markers at clearance prices. Budget Prices in USA and Canada for wholesale custom imprinted dry erase markers. MADE IN USA. Our versatile fine point dry erase markers work great on white board, glass and any other non-porous surface. The ink is easily removed with a dry cloth, tissue or eraser. They are made from low odor, non-toxic inks that will not irritate your eyes or nose. Certified AP Non-Toxic by the Art and Creative Materials Institute. Meets or Exceeds ASTM D-4236. We also supply wholesale blank (not imprinted) dry erase markers: see the Price Table below. Unit prices below include your 1 color, 1 side imprint, or they are for blank (not personalized) dry erase markers. Setup Charge: $40.00 per order; $20.00 on re-orders. Standard Production Time: 4-6 working days after art approval. Rush Production is available: contact us. Dimensions: 5 7/8" X 3/8"
Imprint Area: 23" x 0.875"
Color Selection: Black, Blue, Red, Green, Yellow, Orange, Brown and Purple. Color of cap matches ink color. White barrels. Imprint Colors: Imprint color will match ink color unless otherwise specified.